In its Weekly Report on Israeli Human Rights Violations in the Occupied Palestinian Territories for the week of 24– 30 March 2016, the Palestinian Center for Human Rights (PCHR) found that Israeli forces continued to use excessive force in the Occupied Palestinian Territories. 2 Palestinian civilians were wounded and then shot dead in Hebron, south of the Gaza Strip, while six Palestinians were wounded this week. In the West Bank, Israeli forces extra-judicially executed 2 Palestinian civilians in Hebron, south of the West Bank, and wounded 3 others. Israeli forces conducted 83incursions into Palestinian communities in the West Bank. 76 Palestinian civilians, including 27 children and 2 women, were abducted. Fifteen of them, including 9 children and a woman, were abducted in occupied Jerusalem. Israeli forces continued their efforts to create Jewish majority in occupied East Jerusalem. A room and a playground in Silwan village were demolished, paving the way for the confiscation of 14 dunums for the interest of “national parks”. In a crime that amounts to an extra-judicial execution, on Thursday, 24 March 2016, Israeli forces killed 2 Palestinian civilians in Hebron. Israeli soldiers opened fire at both of them after the latter stabbed an Israeli soldier in his shoulder. After the 2 Palestinians were wounded, Israeli soldiers opened fire again at them and shot them dead. Following a video was published displaying the crime, Israeli forces announced they have detained the soldier that opened fire and initiated an investigation. 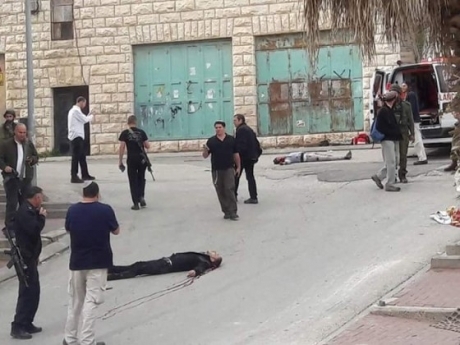 PCHR stresses that this crime was committed because the Israeli military and political leaders allowed the soldiers to shed the Palestinians’ blood. It should be noted that the 2 killed Palestinian were identified as Ramzi Aziz Qasrawi (20) and Abul Fattah al-Sharif (20). On 25 March 2016, a Palestinian old man was hit with a bullet to the head during his participation in Kufor Qaddoum weekly protest, northeast of Qalqilya. On 26 March 2016, Israeli forces wounded 2 Palestinian when the former opened fire at al-Naqqar neighbourhood, west of Qalqilya, where a number of Palestinian youngsters gathered and threw stones at Israeli soldier. In the Gaza Strip, Israeli forces wounded 3 Palestinian civilians in the northern and central Gaza Strip. On 25 March 2016, Israeli forces wounded 2 Palestinian civilians, who were participating in a peaceful protest, north of the Gaza Strip. The first was wounded by a bullet to the right leg and the second was hit with a tear gas canister to the face. On the same day, in a similar protest in the east of al-Bureij refugee camp, in the central Gaza Strip, a civilian was hit by a gas canister to the left thigh. In the context of targeting border areas along the Gaza Strip, on 25March 2016, Israeli forces stationed behind a sand barrier at the border fence between the Gaza Strip and Israel, east of Jabalia, north of the Gaza Strip, opened fire at the border area. On 26 March 2016, Israeli forces stationed at the border fence, east of Abu Safya area, east of Jabalia too, opened fire sporadically at the border area. On 29 March 2016, Israeli forces stationed at the border fence, east of Gaza Valley, opened fire towards shepherds and farmers. As a result, they fled fearing for their lives, but neither casualties nor material damage were reported. Settlement activities continued in the West Bank. On 29 March 2016 , Israeli authorities used the municipality bulldozers accompanied by officers from the Israeli Nature Authority demolished a playground, a room and walls belonging to Khaled al-Zeer in al-Abasiya neighbourhood in Silwan village, south of the Old City of East Jerusalem, under the pretext of non-licensing. It should be noted that the Nature Authority threatens to confiscate the land of the abovementioned person to turn it into national parks for settlement projects. In a similar context, Israeli bulldozers surrounded a house belonging to Mohammed Samreen in al-Abasiya neighbourhood in Silwan village and then levelled his land without warning. The aforementioned person said that the family turned the land from a landfill to an agricultural land. On 29 March 2016, Israeli forces demolished a house, a farm, 2 playgrounds and 2 electricity and water networks for non-licensing. They cut off also a number of trees and levelled lands at the northern entrance to Bethlehem near the military checkpoint “300”. The abovementioned demolished property belong to Khader al-Jarashi. Following the Friday prayer, on 25 March 2016, dozens of Palestinian civilians organized protests against the Israeli policies in the Occupied Palestinian Territories at the western entrance of Silwad village, northeast of Ramallah, in the vicinity of “Ofer” prison,southwest of the city. Israeli forces used force to disperse the protest and fired live bullets, metal bullets, tear gas canisters and sound bombs at the protesters. As a result, many civilians suffered gas inhalation and others sustained bruises as Israeli soldiers beat them up. At approximately 14:30 on Friday, 25 March 2016, Israeli forces stationed inside Beit Hanoun” Erez” crossing and its vicinity, northwest of Beit Hanoun village, north of the Gaza Strip, fired live bullets, metal bullets and tear gas canisters at dozens of youngsters who were at that time along the asphalt road connecting the Israeli and Palestinian sides of the crossing. The protesters threw stones at Israeli soldiers protesting against the Israeli violations against Palestinians in occupied Jerusalem and the West Bank. Clashes continued for 18:00 and resulted in injuring two civilians: Hasan Mohammed Mansour (21) form Khan Younis, was hit with a live bullet in his right leg, and Ziyad Saed Mohammed Abu Nada (28)from Jabaliyah, who was hit with a tear gas canister in the face. Around the same time, dozens of Palestinian youngsters headed to the border fence between Gaza Strip and Israel, east of al-Buraij, in the centre of the Gaza strip. They threw stones at Israeli soldiers stationed behind sand barrios inside the abovementioned border fence. As a result, Israeli forces fired live bullets at the Palestinian youngsters and wounded Mohammed Ali Dosuqi (23) with a gas bomb in his left thigh. Following the Friday prayers, on 25 March 2016, dozens of Palestinian civilians and international activists organized protests in the centre of Kafr Qadoum village, northeast of Qalqiliyah near the western entrance of the village, in protest of its closure since the beginning of al-Aqsa Intifada with an iron gate. When they reached the abovementionedgate,Israeli soldiers fired live bullets, metal bullets, sound bombs andtear gas canisters at the protesters. As a result, Tayseer Abdullah Abdul Rahem Shutaiwi (68) was hit with a live bullet to his head. At approximately 17:00 on Saturday 26 March 2016, the protest was again organised, but no injuries were reported. Following the prayers of the same Friday, dozens of Palestinians and Israeli and international Human rights defenders organised protests against the annexation wall and settlement activities in Bil’in and Nil’in villages, west of Ramallah and al-Nabi Saleh, northwest of city. Israeli forces used forces to disperse the protesters and fired live bullets, metal bullets, tear gas canisters and sound bombs and chased the protesters into the olive fields and houses. As a result, many civilians suffered gas inhalation, and others sustained bruises as Israeli soldiers beat them up. Moreover, Israeli forces intentionally targeted a house belonging to Khalil Mustafa Oumairah and a vehicle belonging to activist Mohammed Oumairah with tear gas canisters and sponge-tipped bullets. As a result, the vehicle’s windscreen and the windows of Oumairah’s house were smashed, and the water tank was destroyed too. Due to the number and severity of Israeli human rights violations this week, the Palestinian Center for Human Rights made several recommendations to the international community. Among these were a recommendation that the United Nations provide international protection to Palestinians in the Occupied Palestinian Territories, and to ensure the non-recurrence of aggression against the Occupied Palestinian Territories, especially the Gaza Strip. In addition, the PCHR calls upon the High Contracting Parties to the Geneva Conventions to compel Israel, as a High Contracting Party to the Conventions, to apply the Conventions in the Occupied Palestinian Territories.